?We offer one free rope and oval chain. Rope length: women-50CM;men-60CM. Made of stainless steel.It is hypoallergenic, you can rest assured to wear. ?Design Concept: "Heart always" pendant is a symbol of romantic love. Send him or her a beautiful hart heart-shaped pendant, let it to witness the sweet and beautiful love between you. 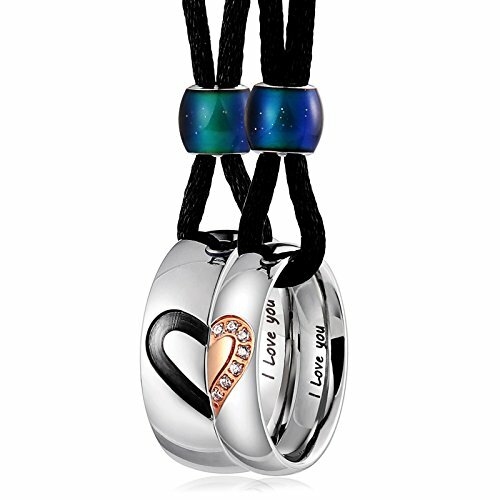 Heart-shaped pendants to protect your happiness, true love will not far away, on your side. ? Perfect Gift: Perfect for daily wear, also an ideal gift for your Lover or Friend, etc. Great gifts on anniversary day, valentine's day, christmas day and birthday. Suitable for all occassion. ? Maintenance: If you do not wear your necklace, please put it in our distribution jewelry bag or box for preserving. Regularly wash your necklace once a month can keep it brightness. ?Perfect After-Sales service:Aienid provide the best jewelry, fine jewelry bag,30 days return and refund,100% service for our customer.? your customer is our motivations to improve. We are looking forward to your 5 star review.Welcome to contact us!